Discussion Metadata Synchronization Smugmug to Lightroom? Metadata Synchronization Smugmug to Lightroom? I was wondering if there is a way to get the metadata that I changed in Smugmug to transfer back to Lightroom? Via the plugin or some API thing? Thanks! The SmugMug Lightroom Plugin has the options to do bi-directional sync. You'll be returned to the Publish Plugin Settings, now click "Bidirectional Metadata Syncing"
I'm not seeing the Advanced Sync option. I'm on Win7 with LR 6.7. Is this only on the Mac version or only on LR CC? This is a DGrin special! Y'all are about to become super special Beta Testers! If you open the open the Plug-in Manager (the screen with the SmugMug logo), and Press the "Control" and "Alt" (PC) or "Control" and "Option" (Mac) and, while still holding those keys, click on the SM logo, you'll unlock our little easter egg that enables those features. Keep in mind that we're still working on these and they're in beta stage, but feel free to pass along anything you love, hate, or we could improve upon! It mostly works as (un-)advertised, although I did have one case where it refused to update one of several pictures where I had edited things on SM side. And it kept refusing to do so for that one picture. At the moment the SM caption on this picture is the most recent edit, but I can't sync it down to LR. When I try, the failure to sync is flagged but the error message is uninformative. The image shows up in the LR Sync Summary pop-up window with the image showing and with a yellow triangle with an ! inside. But the only text is the word "Metadata". The Sync Loupe (the button with the ! inside a circle) shows nothing on the SM side and the wrong picture on the LR side. OK, it's unhappy, but now what? I do appreciate having the ability to push keywords down from SM to LR. For the most part, I like to treat LR as the master, do the editing there, and push the keywords up, but there have been a few times when the workflow was simpler if I made the changes directly in SM and then came back and fixed LR after the fact. For titles and captions, the new plugin is less capable than Smug SyncBack, and in some circumstances a bit ill-mannered. Smug SyncBack lets you confirm moves before making them. The SM plugin just plunges ahead. That review step is helpful in some use cases I get into occasionally. I really do like to edit captions on the SM side where the browser can spell-check. Then I can send the results back to LR with Smug Syncback. But I also review and edit captions for content on the LR side. It's not impossible for me to do a content edit on the LR side, forget to publish (or defer doing so because I'm not quite happy with the edit), and later do some editing for spelling on the SM side (maybe the same picture, maybe different ones). When I try to push the SM-edited captions down, Smug SyncBack shows the two versions and asks me what I want to do. (The default set to have the newer caption overwrite the newer one, either way.) At that point, I can catch the fact I have old LR edits out there and work to reconcile everything. The SM plugin would just go ahead and have a newer SM caption overwrite the LR caption sitting in the Modified Photos to Re-Publish queue or push up the newer but unpublished not-quite-yet-ready LR caption. Maybe that's good, but maybe not, and overwriting things in LR's Re-Publish queue without asking seems to be bad behavior. Whatever you do, when you roll this out, really emphasize that the metadata sync is newer-to-older, not SM-to-LR. If the LR metadata is newer, syncing with the plugin will push the LR information up, not pull the SM information down. That seems the best approach to me, and the word "bi-directional" is there, but it's a different paradigm than syncing photos where SM is the always the master version ... and the two buttons are right next to each other. I can certainly imagine someone thinking that they could use the plugin to "erase" a bunch of errant caption edits on the LR side and having those errant LR captions pushed live instead. On the other hand, that bi-directional capability is useful for pushing caption or keyword changes up without republishing the whole image when LR thinks it wants to do that. So for now, I'll probably mostly use Smug Syncback on captions and keep the plug-in syncback for keywords and for LR-to-SM metadata moves where I don't want to publish the image. Thanks for diving in and giving us some great feedback. I'll discuss these with our LR Developer! In addition to SmugMugs upcoming sync there is a free plugin available for Lightroom called Smug Syncback that will do just that: Sync title, caption and keywords from SmugMug to (or from) your Lightroom catalog. It has a GUI for great overview and control of what actions will be taken. I really wish this would work, but unfortunately neither the beta version of the SM plugin nor the Smug Syncback worked as desired for me. With the first one, I am not sure if I could see any changes at all, after syncing. The other found only about ten images to sync in an album with several hundreds of images that needed syncing. Before I tried, I made a full image sync with the SM plugin, so Lightroom should be aware of all the images on the web. If you have any problems with the beta bidirectional syncing, could you write back with detailed information so that we could take a closer look? Which specific steps do you take? What specific version of Lightroom and the SmugMug plug-in do you use? First I deleted my SM account from the LR plugin and re-connected to start with a new sync from scratch. 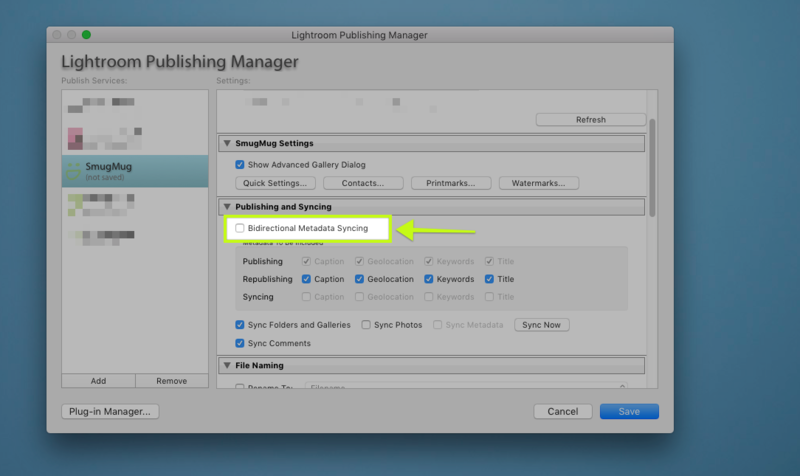 I checked for everything in the Publishing and Syncing part in the plugin window and pressed Sync Now. When the sync was finished, my screen was full or error messages, but unfortunately I can't remember what they said. I went through all sync conflicts and closed the window (couldn't see any place to save the changes). 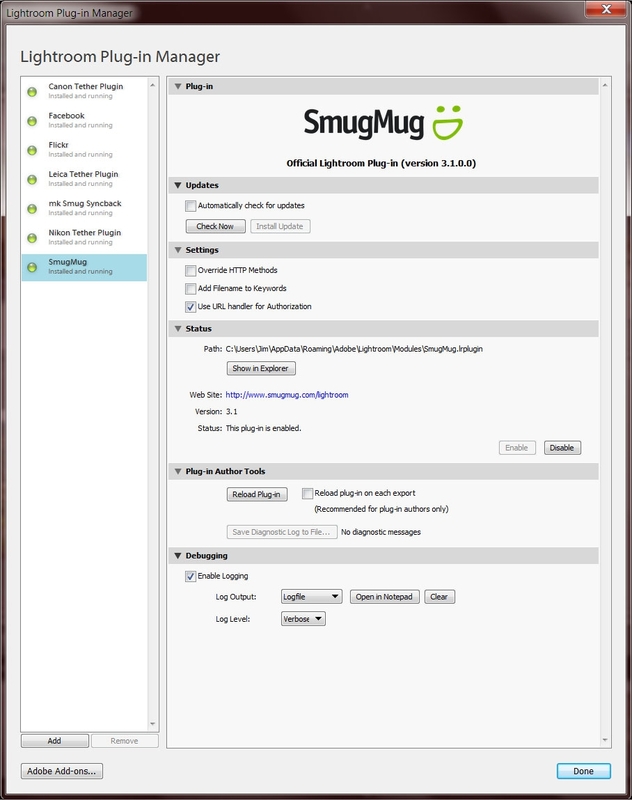 I have the SmugMug LR plugin 3.1.3.0 and Lightroom version 6.12. My operating system is Mac OS Sierra 10.12.6. Do you mean actual error messages or just conflicts? Conflicts are quite normal when syncing photos as the plug-in may not be able to match up all the data, especially when you start over from scratch. If you refer to actual error messages, it would be useful for us to know the exact error messages. Perhaps the next time you encounter these, you could take a screenshot of your whole screen and include that here? "An internal error has occurred. Bad argument #1 to '?' (string expected, got nil)". 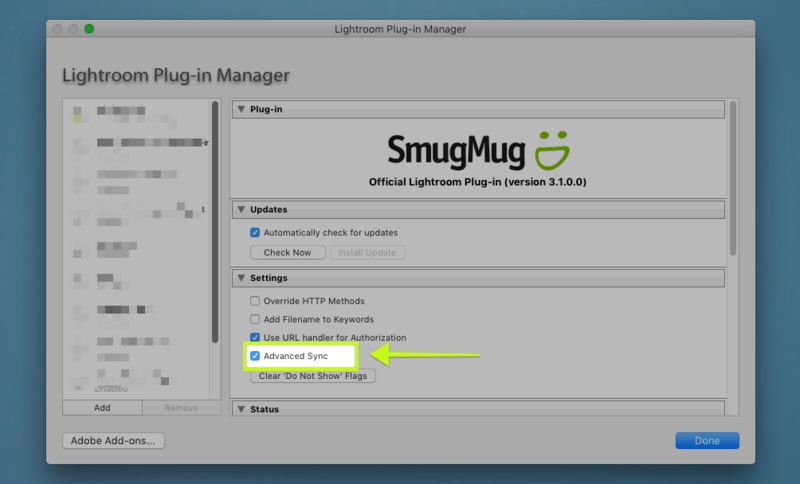 Could you enable logging for the SmugMug plug-in in the Lightroom plug-in manager and set the log level to "verbose"? Afterwards try recreating the error again and attach the log file to a post. If you prefer to not post your log on a public forum, you may always contact our HelpDesk with details. I made a new sync now, and I have sent a log file to your HelpDesk. @leftquark Hi! I followed your directions to unlock the bidirectional feature in LR to sync smugmug photos to LR but it didn’t work for me. I have the latest version of the plugin, please help. Thx. There is a beta feature you can turn on that will allow this. It is a Beta as far as I know so use it as such. Click file plug in manager. Double click the SmugMug logo at the top. You'll then be able to select bi-directional syncing.